Due to a delay with fuel transfer, a Soviet patrol on Damansky Island (known as Zhenbao Island to the Chinese) stumbled across a would-be Chinese ambush beginning to move out. 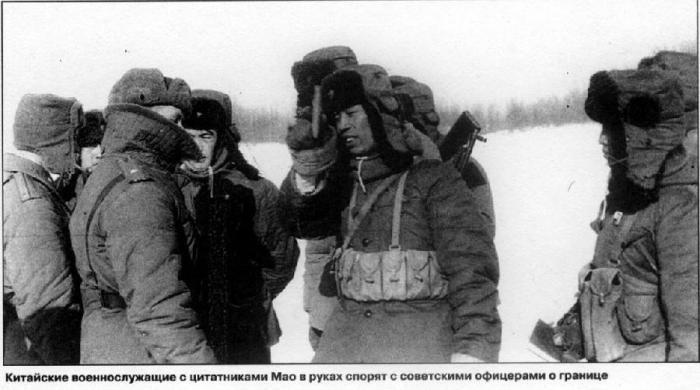 The Soviets counter-ambushed the Chinese, killing dozens. Cries for revenge spread over China, prompting Mao Zedong to declare war and storm the disputed territory on March 15. Initial Chinese casualties were high, but the far eastern Soviet stations ran out of munitions and found themselves overwhelmed by May. The beginning of the altercation could be traced back to 1964, when Mao Zedong, leader of Communist China for over a decade, mentioned during a meeting with socialist Japanese that Tsarist Russia had taken valuable lands from the Chinese in unfair, century-old treaties. Even excluding eastern Siberia, Kamchatka, and other regions that had become all but fully Russian, there were several disputed areas along key rivers, most notably the Ussuri River, where Russia had claimed islands that normal shipping lane agreements would have given to China. Mao's statement spread, and tensions escalated along the 2,738 mile border. With an initial Soviet victory at Zhenbao sparking the anger that had been brewing for five years since Mao's comments, the Chinese called for vengeance against decades of unfair treatment. China mobilized, as did the Soviet Union under Leonid Brezhnev. With successes in the east, the Chinese launched a western campaign across the disputed Pamir Mountains, where a vague border had been established at the ridge of the Sarikol Range. The invasion proved costly, and the Soviets successfully held Tajikistan. While a tactical defeat, the draw of materiel to Tajikistan allowed for further gains in the east as China marched to the Sea of Okhotsk. Brezhnev contemplated using the USSR's massive nuclear stockpile against the Chinese, sending out similar diplomatic feelers toward the United States as the US had done earlier in the 1960s in potential attacks against Chinese nuclear weapons sites. The administration of President Richard Nixon made its stance clear that conflict could never again escalate to the point of nuclear war, and that either side that launched first would suffer an immediate declaration of war by the United States. Battles through the summer had gone too far to turn away from fighting, and now Brezhnev was forced to follow the same “limited warfare” as the United States had seen in Korea and, concurrently, in Vietnam. Although officially neutral, the US seemed to side more with the Chinese. As backroom deals went through, the war in Vietnam transformed from a stalemate to a ceasefire. Communist supplies had been cut from both the Soviet Union and China as they were needed for their own fighting, and leader Ho Chi Minh had died only months after the Sino-Soviet War began, leaving followers without strong connections. The nation was eventually divided peaceably between the Communist north and Capitalist south, action for which US Secretary of State Henry Kissinger would win a Nobel Peace Prize. Meanwhile, war between the Soviets and Chinese would drag on through the 1970s. Mongolia and Afghanistan became forced staging grounds between the two powers and suffered heavy civilian casualties. The United States continued to back China, supplying aid in a lend-lease program while never officially outraging the Soviet Union. After a decade of siege and counter-siege, the two nations began to call for an end to the seemingly unwinnable war. In the Treaty of Tashkent in 1982, the war officially ended, though fighting had quieted for some time. Russians had taken their fill of combat and rations, and the seeds of revolt were planted. Brezhnev left office that November, and his successor Yuri Andropov died in February of 1984, prompting revolution rather than instating another General Secretary. China had become a very different nation by the end of the war. Mao Zedong had died in 1976, and his successors grew close to the Americans for their continuing support. The increase of comfort with capitalism started new economic freedom as well as an influx of American culture. While still carrying a powerful and centralized government, free elections were encouraged through the 1980s, building a new era of prosperity and growth. The real winner of the war proved to be the United States, whose economy flourished with Chinese repayments of debts as well as in new markets in Eastern Europe where the Soviet collapse created a power-vacuum ready to be filled with blue jeans and McDonald's. In reality, the Chinese ambush was successful. Fifty-eight Soviet soldiers were killed with 94 more wounded. Soviets retaliated on March 15 with artillery fire and secured Zhenbao Island. The war was cut short when troops were ordered not to fire upon returning Chinese soldiers. After the funeral of Ho Chi Minh, Soviet Prime Minister Alexei Kosygin visited Beijing and restarted diplomatic communication, however frictional. The two would never fully go to war, but gears would be set in motion to break the duality of the Cold War.